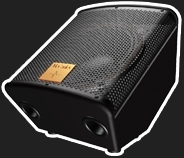 The SM92-1 was designed as a compact, full range monitoring system for professional touring and staging applications, with emphasis on providing superior, high-impact sound while maintaining a very small footprint and low stage profile. Utilizing McCauley’s high impact Coaxial componentry, the SM92-1 offers extraordinary acoustic quality and high SPL output, rivaling conventional systems many times its size. The SM92-1 is a full range, 2-way point-source coaxial system in a computer optimized enclosure. Loud-speaker complement consists of a single proprietary coaxial device. Mechanical attachment aligns the acoustic center of the high frequency driver with that of the low frequency transducer, distributing perfectly aligned high and low frequency energy along an 80o conical coverage pattern. An optimized switchable biamp to passive crossover network is included standard. The enclosure is constructed of durable 12-ply void-free birch laminate, dadoed for strength and durability. Perforated steel is employed for frontal protection of the loudspeaker complement.